The Poodle Club of America, Inc. allows any registered Poodle over six months of age which meets the performance requirements to receive the Working Certificate and the Working Certificate Excellent. The purposes of these Certificates are to test the natural working ability of the Poodle and to demonstrate his interest in birds, his ability to take direction from the handler, his marking ability, his willingness to enter the water, and his trainability. These tests are designed to enable most Poodles with a natural working instinct to pass the Working Certificate Test and with modest training to pass the Working Certificate Excellent Test. These programs provide an avenue for Poodle owners to enjoy and develop an appreciation and understanding of the natural working abilities of their dogs and to engage in early training as a working retriever. For the Performance Requirements in the Working Certificate and Working Certificate Excellent, download the Rules and Guidelines for WC/WCX Tests. Learn more about PCA WC/WCX Medallions. Hunting Tests evaluate a dog's hunting abilities; Standard Poodles are eligible for retriever hunting tests. The dog's ability to perform is judged against a standard of perfection established by the AKC regulations; theoretically, every dog can be a winner! Dogs receiving Qualifying Scores at a number of tests achieve titles of Junior Hunter (J.H. ), Senior Hunter (S.H.) and Master Hunter (M.H. ); each successive title requires more skill. A Junior Hunter title is only a moderate amount of work with a good hunting dog. 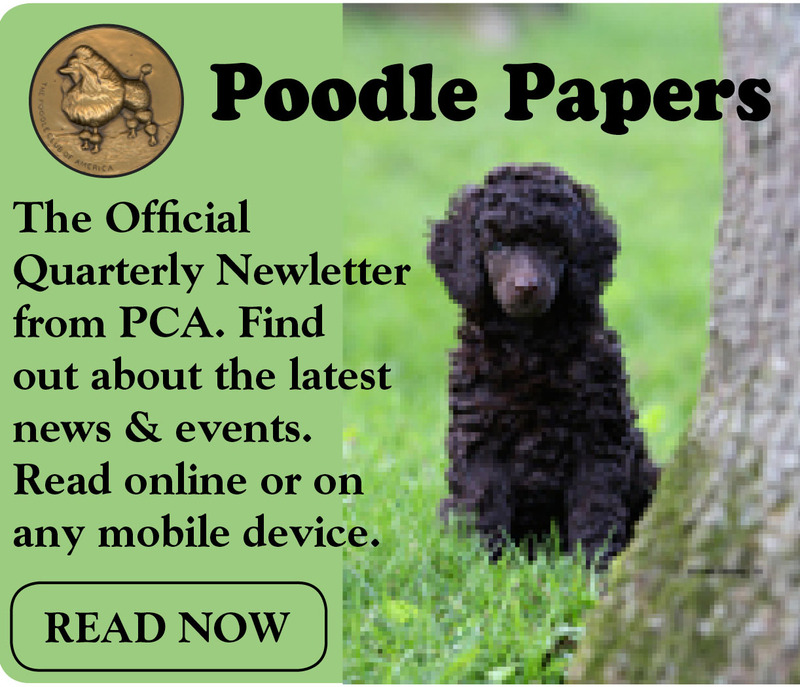 From the AKC Secretary's Page: Poodles Eligible to Participate in the Spaniel Hunting Tests - The Board VOTED to permit miniature and standard size Poodles to be eligible to enter the Spaniel Hunting Test program. Titles earned in Spaniel Hunting Tests will be designated with a “U” to differentiate the title from those earned in Retriever Hunting Tests (example: JHU). Poodle clubs with documented experience in upland hunting activities can apply to become licensed to hold Spaniel Hunting Tests for tests held after the effective date of this recommendation. This is effective with the Spaniel Hunting Test held in conjunction with the PCA National Specialty in April 2017! Upland hunting traditionally consists of walking through the fields, locating birds, flushing them out of cover, and shooting and retrieving them. Upland hunting varies widely from the sparse vegetation of the high desert, to the high cover of corn fields, to the dense cover of fence rows, to woodlands. The type of bird varies, based on the habitat. Game birds include pheasant, chukar, partridge, woodcock, doves, various kinds of quail and grouse, and pigeons. With all of them, a good dog makes a valued hunting partner, a role that poodles have been filling for a long, long time.